Prep time: 30 mins. Cook time: 30 mins. Total Time: 60 mins. Flatten chicken to about ¼ inch thick. 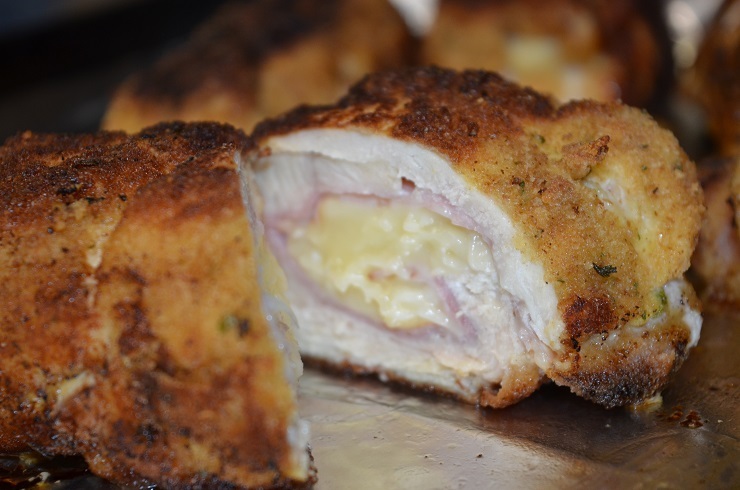 Place 1 slice of ham and 1 slice of cheese on each chicken half, roll and tuck the ends of the chicken, use toothpicks to secure. *TIP: Place chicken breast in large Ziploc bag to flatten. It’ll keep clean up to a minimum and the raw chicken doesn’t touch anything but the inside of the bag. In one bowl, combine salt, pepper and flour. In second bowl, whisk eggs and milk together. In a third bowl, place bread crumbs. Heat EVOO in large pan over medium high heat. Coat chicken in flour mixture, then egg mixture, then bread crumbs. Brown chicken on all sides, transfer to greased baking dish. Transfer to plate, top with freshly grated parmesan cheese.